Diskless - No populated hard drives. ReadyNAS 2304 offers the ideal solution to a small and medium size business (SMB) that requires file serving and data backup to support teams of up to 40 employees. The RR2304 supports the entire suite of features in ReadyNAS OS, including 5 levels of data protection, ReadyDR disaster recovery, and virtualized storage for VMware and other virtualized networks. 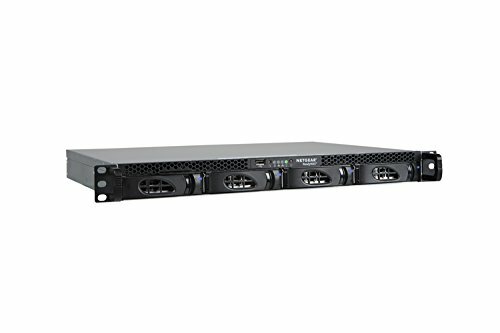 Powered by a dual core Intel CPU, the RR2304, features a dual Gigabit Ethernet interface, delivers over 2x the data throughput of its predecessor, the RN2120, with significant processing capacity headroom. The superior hardware architecture enables the RR2304 to perform all business applications in the ReadyNAS OS, including ReadyDR, a block level backup solution for disaster recovery, as well as ReadyNAS Milestone VMS, a surveillance video management system.